The 2014 TSM Progress Report takes a detailed look at MAC membersâ€™ efforts to contribute positively to the communities where they operate in the initiativeâ€™s three focus areasâ€”communities and people, environmental stewardship and energy efficiency. The report includes performance results for 62 facilities from 23 mining companies, seven of which had their results externally verified by a third party. For the first time, facility-level performance data for TSMâ€™s newest protocols, biodiversity conservation management and safety and health, are available in the report. In the area of Aboriginal and community outreach, results for effective community of interest engagement and dialogue remained strong with 82% of facilities reporting a Level A or higher. The percentage of facilities at a Level AAAâ€”the highest ranking possibleâ€”for this indicator has increased from 13% in 2006 to 42% in 2012 and 48% in 2013. The number of facilities assessed at a Level A or higher for demonstrating commitment and executive-level accountability for managing biodiversity conservation nearly doubled year-over-year, increasing to 60% in 2013 from 33% in 2012. A majority of 85% of facilities reported a Level A or higher for implementing comprehensive energy use and GHG emissions tracking and reporting systems for internal and public reporting. Tailings management results remain strong, with 96% of facilities reporting they have implemented an operation, maintenance and surveillance manual that adheres to industry best practicesâ€”an increase of 4% from 2012. Following the Mount Polley tailings breach in August 2014, MAC has committed to reviewing TSM requirements and its tailings management guidance documents, which are considered global best practice, to incorporate any lessons learned from the ongoing investigation into the incident. TSM is a performance-based program that was developed by MAC and its members to help mining companies evaluate and manage their environmental and social responsibilities. It is the only system in the world that includes public reporting of third-party assured site-level performance for the mining sector. Since TSM launched in 2004, the Mining Association of British Columbia and the Quebec Mining Association have adopted the program for their members. 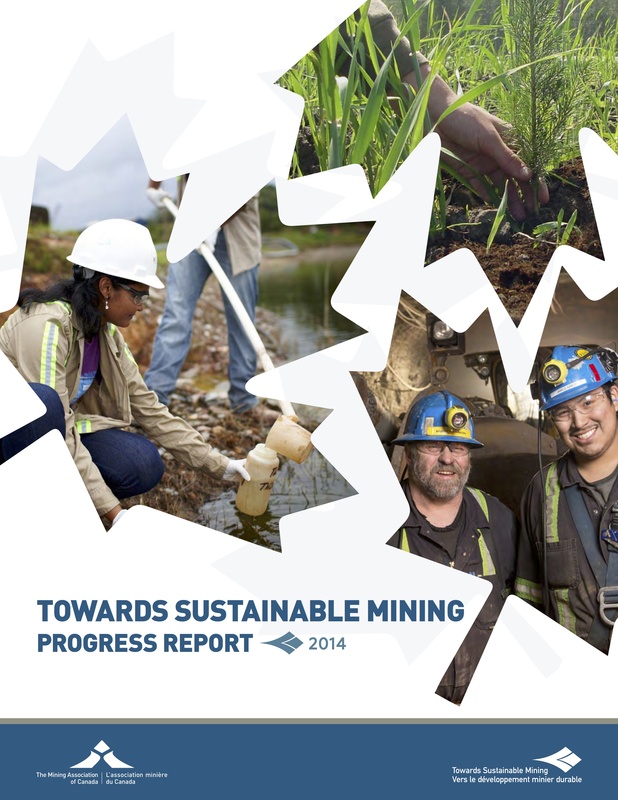 To download the 2014 TSM Progress Report, or to learn more about the initiative, please visit www.mining.ca. Our newest video explains why the TSM initiative is being increasingly used as a tool for investors in assessing social, environmental and governance risks, and to help inform their mining investment decisions. In response to this growing interest in TSM among the investment community, MAC produced a new, short video that features Stephen Kibsey, Vice President of Risk Management, La Caisse de dÃ©pÃ´t et placement du QuÃ©bec, and member of MACâ€™s Community of Interest Advisory Panel; Irene Sosa, Senior Analyst from Sustainalytics, a global leader in sustainability analysis; and Pierre Gratton, MACâ€™s President and CEO. The video explains TSMâ€™s usefulness in providing a way of evaluating and quantifying hard to measure, hard to quantify aspects of performance at the mine-site level. This includes measuring how well a facility is engaging with communities of interest in various aspects of its operations, or if the mine is adhering to best practices in tailings management, amongst a wide range of other environmental and social areas. Please visit www.mining.ca/tsm-videos to view the video. MAC is accepting nominations for the 2015 TSM Excellence Awards, which includes the TSM Community Engagement Award and TSM Environmental Excellence Award, until January 30, 2015. Established in 2014, the TSM Excellence Awards will recognize innovative projects and initiatives annually that expand and promote sustainable development within the mining sector. The winners will be presented with the awards at the Canadian Institute of Mining, Metallurgy and Petroleum's (CIM) Awards Gala in May. The Awardsâ€™ selection committee, comprised of members from MACâ€™s national community of interest (e.g. stakeholder) advisory panel, will select finalists based on criteria such as innovation, involvement of and engagement with communities, and project outcomes. TSM performance will also be considered as an indicator of the companyâ€™s ongoing commitment to corporate responsibility. For more information about the TSM Excellence Awards and the nomination process, please visit www.mining.ca/tsm-excellence-awards. In recent keynote addresses at the North America Mining Expo in Sudbury and at a Vancouver Board of Trade luncheon last month, MACâ€™s Pierre Gratton spoke about why Canada needs to hold onto its global leadership in mining, and stressed the areas that require government action to enable the industry to thrive in an increasingly competitive global environment. "The opportunity is there for Canada to continue to responsibly develop its mining industry, and the jobs, business development and community investments that go along with it. Governments and individuals all play a part in deciding whether we seize those opportunities, or whether we slowly recede and let other countries, perhaps more desperate for the wealth mining brings, take them instead." Gratton noted that Canada benefitted tremendously from the past decade of rising commodity prices, seeing a 25% increase in the number of new mines, increased employment and rising government revenues, but pointed to a few areas where Canadaâ€™s mining industry has lost ground recently. For example, last year, after an eight-year period as the top jurisdiction for global exploration spending, Canada fell to the second spot behind Australia. In terms of mineral production, Canada has also declined from being the top five producer of 14 major minerals and metals in 2007 to 11 today. To explain these declines, Gratton notes that Canadaâ€™s mining sector operates in a much more competitive global environment. Some basic business fundamentals make Canada an expensive place to build new mines. This includes rising energy and operating costs, skills shortages, a lack of critical infrastructure to build new mines in increasingly remote and northern regions, high transportation costs to get goods to market, and complex and lengthy regulatory processes. Gratton also dismissed recent commentary that Canada risks losing its strength as a resource rich country due to new demands that industry must earn â€œsocial licenceâ€ or due to recent rulings on Aboriginal title and rights. â€œIf you look at our track record, with over 260 agreements with Aboriginal communities concluded across the country, very few mining projects have failed due to a lack of community support. While a business risk, I don't believe social licence is a significant obstacle to new mine development in Canada because, overall, our practices have kept pace with or exceeded new expectations." Gratton also addressed the serious tailings breach at the Mount Polley mine, and the efforts the industry must undertake to reassure Canadians about its commitment to safety and environmental protection. Noting that over 200 mines across Canada operate safely every day, Gratton acknowledged that a failure of this sort is unacceptable. The Canadian mining industryâ€”and MAC and its members in particularâ€”have spent the past two decades working to improve practices in this area so that tailings failures never occur. Gratton stressed that while the cause of the breach is still under investigation, MAC and its members are determined to learn from this event. He stressed that industry expects effective regulation and oversight of tailings facilities in concert with robust design, operation and maintenance practices. 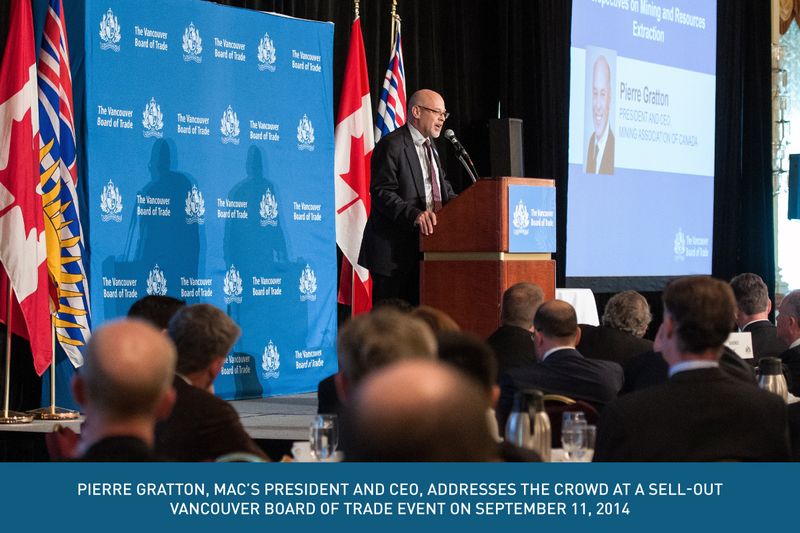 To read Grattonâ€™s speeches in full, please visit www.mining.ca/resources. This fall, MAC kicked off its latest ad campaign promoting the contributions of the Canadian mining industry, which is currently in market in the National Capital Region. With the election top-of-mind as we approach 2015, the ads have taken on a political theme, tying minerals and metals to items that characterize elections, such as ballots, campaign buses and debates. Also introduced this year is a series of ads that celebrate Canadaâ€™s democracy with symbolic imagery of Parliament Hill. While previous yearsâ€™ campaigns focused on miningâ€™s connection to modern and useful products, this year we are highlighting the role that minerals and metals play in the daily lives of Parliamentarians and leaders who serve the public in Canada. 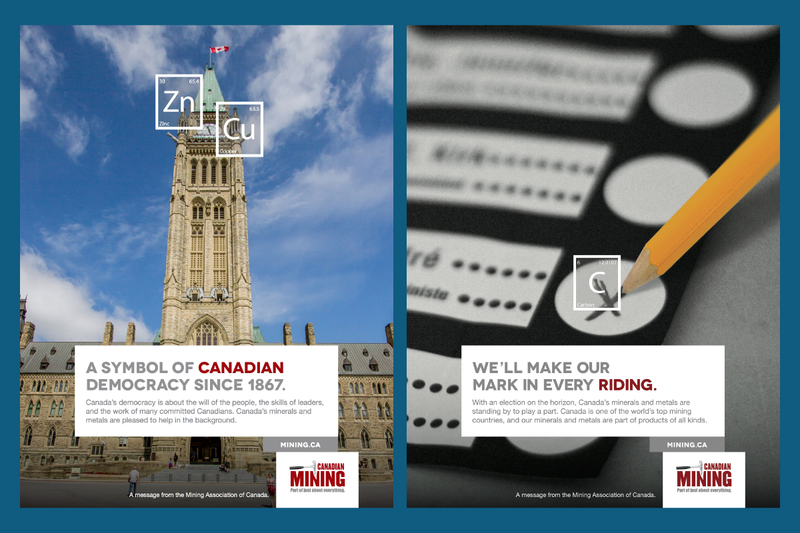 The ads will be appearing in the lead-up to MACâ€™s annual lobby day, Mining Day on the Hill, which will be held on November 18, 2014. 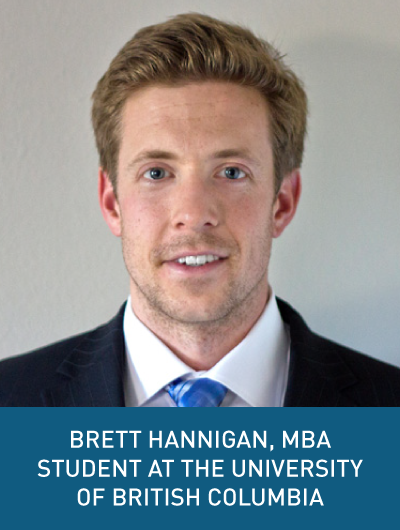 MAC and its members have named Brett Hannigan of Surrey, British Columbia as the 2014 recipient of the Paul Stothart Memorial Scholarship in Mineral Economics, a $3,500 value. Brett is currently studying a Master of Business Administration at the Sauder School of Business at the University of British Columbia (UBC). He also holds a Bachelor of Science, Earth Sciences, from Simon Fraser University (SFU). Brettâ€™s exemplary academic achievements and his strong interest in the minerals sector, as evidenced by his volunteer record and work experience, impressed the scholarshipâ€™s selection committee. He is President of the Natural Resources Club at UBC and, in 2009, acted as an ambassador at the PDACâ€™s Student Industry Mineral Exploration Workshop. He is a professional geoscientist and has worked in the sector in several geologist, environmental scientist and strategy roles since graduating from SFU in 2009. Brettâ€™s vision essay revealed a strong understanding of the role that economics plays in the mining industryâ€™s ability to seize growth opportunities and overcome challenges, such as rising operational costs and adjusting to ever-changing commodity prices. Qualified candidates must be studying either a Bachelor or Master of Economics, or a Master of Business Administration at a Canadian university. Students can submit their applications until May 15, 2015 and the scholarship will be awarded for the 2015-2016 school year. For more information about the scholarship and eligibility, please visit www.mining.ca/scholarship. The scholarship was established in 2012 from the generosity of MAC member companies in memory of the late Paul Stothart, MACâ€™s former Vice President of Economic Affairs.